Just last year, researchers observed 2016 HO3, a satellite of our planet. And now new and more comprehensive observations, displayed at the Annual Division for Planetary Sciences Meeting, have now verified that the object is certainly a piece of rock with unknown origin but certainly not a bit of space junk. The path of 2016 HO3 is strange, to say the least. It circles the Sun, and also orbits our Earth, moving between 38 and 100 times the distance between our planet and the Moon. So it’s quiet close enough to make its origin complex but a bit too far to be studied in detail. To understand 2016 HO3, Assistant Professor Vishnu Reddy and his team from the University of Arizona decided to perform some ad hoc observations during a close approach. The team wasn’t able to constrain its size – which is definitely no larger than 100 meters (330 feet) – but could tell that it rotates on its axis twice in an hour and reflects light just like asteroids do. "While HO3 is close to the Earth, its small size – possibly not larger than 100 feet – makes it challenging target to study," Reddy said in a statement. "Our observations show that HO3 rotates once every 28 minutes and is made of materials similar to asteroids." 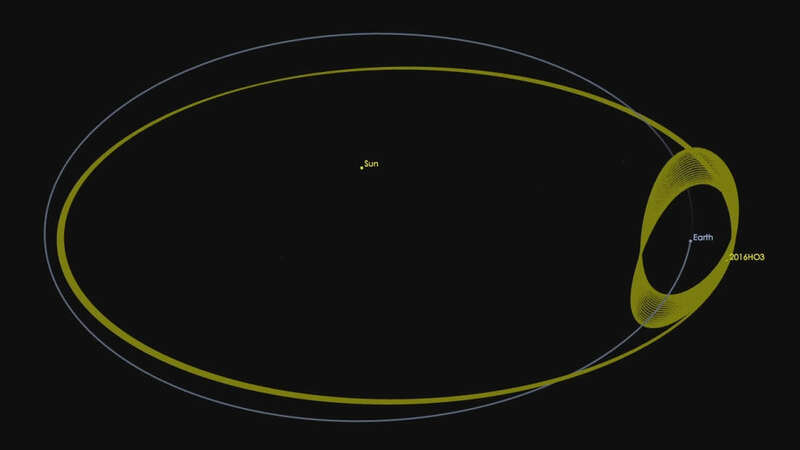 2016 HO3 is one of the five quasi-satellites of Earth and it’s the one with the most stable orbit. These objects are “almost” satellites because their orbit is not exactly stable and might change significantly over time. A lot of discovered quasi-satellites stop being one after a few years, but 2016 HO3 could be stable for hundreds of years. The Earth’s quasi-satellites come from the Near-Earth Object (NEO) population. Once in a while, we push them in a such a way that they hitch a ride along with us. The team used the Large Binocular Telescope (LBT) to characterize the object. Knowing that 2016 HO3 is an asteroid has implications beyond pure astronomy. If we want to establish how easy it is to explore and maybe even to mine an asteroid, having a target which is relatively close might be extremely useful. "Of the near-Earth objects we know of, these types of objects would be the easiest to reach, so they could potentially make suitable targets for exploration," said Christian Veillet, director of the LBT Observatory. "With its binocular arrangement of two 8.4-meter [27.5-foot] mirrors, coupled with a very efficient pair of imagers and spectrographs like MODS, LBT is ideally suited to the characterization of these Earth's companions." With better telescopes, we might soon find that these objects are more common than we thought.